In life, there’s always a reason to celebrate, whether it’s a milestone birthday, sweet sixteen, quinceañera, engagement, bar/bat mitzvah, wedding, baby shower or anniversary. What better way to mark the occasion than to book one of Skyline Cruises’ celebration cruises aboard our premier NYC luxury yacht, the Skyline Princess, which merges all of the perks of a high-end catering hall and restaurant with the beauty of being on right the water! Unique, Memorable Experience: Our lavish NYC party boat is widely regarded as the most popular yacht in New York Harbor and provides guests with dramatic views of the Manhattan skyline and the Long Island Sound. Set Sail All Year Round: Winter, spring, summer or fall, the Skyline Princess is ready to set sail. Our vessel is fully climate-controlled and specifically designed to cruise in any type of weather, all year long. 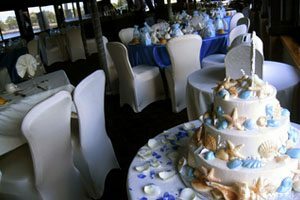 Personalized Service: Our friendly, professional team consists of our well-trained, uniformed crew, expert event planners and on-board, gourmet chef and kitchen staff. Together they provide an unforgettable guest experience, no matter what the event. Choice of Spectacular Views: Want to see the Statue of Liberty, Brooklyn Bridge, Ellis Island, the South Street Seaport, the Empire State Building and other iconic landmarks and skyscrapers that make the New York City skyline so special? Or do you long to see the beautiful coastline of the LI Sound? Depending on your preference, our crew and event planners can coordinate your event for a cruise that will specifically feature the stunning views you desire as the backdrop for your event. Floating Catering Hall: A Skyline Princess Cruise has all of the amenities of a catering hall, from superior service and entertainment to fabulous food, set against the stunning backdrop of New York Harbor. Perfect for Any Milestone: From personal celebrations to corporate outings, holiday parties, and fundraisers, Skyline Cruises is the ideal choice. Ease of Booking: We have a variety of packages available for every type of event, and you can always speak to one of our event planners at 718-446-1100. You can even book an NYC dinner cruise online. Flexibility and Versatility: Our courteous and knowledgeable team will work with you to ensure your event and all of its details fit your needs. We offer on-board DJ entertainment, top-notch food and desserts and premium beverages for all ages. Have your own caterer? We can also accommodate that. Rather hold your event dockside? That’s not a problem either. Secure Ship Environment: Have all of your event needs be met in one place, from food to entertainment, all on board the Skyline Princess. Our yacht features three climate-controlled decks, with the third deck featuring the ability to be open or fully enclosed. Our NYC charter cruise ship is also United States Coast Guard-certified for up to 450 passengers. Worried about seasickness? Rest assured. We sail in calm, sheltered harbor waters, not the ocean, so seasickness is not an issue. Luxury within Your Reach: For nearly two decades Skyline Princess Cruises has been proudly offering the best overall value in the Tri-State area, with its beautiful on-board party accommodations and the most flexible and affordable packages in the New York, New Jersey and Connecticut area. To find out more about Skyline Cruises and learn about our NYC yacht charter cruise event packages, contact us today. We can’t wait to hear from you, and look forward to sailing with you soon!